In concluding his life-changing teaching, “Your Day of Justice,” Dr. Bill Winston has produced several single teachings to explain how believers can practically apply the revelation of vengeance and recompense to their lives. Vengeance belongs to God, and stems from a love of justice, not hatred or resentment toward people. And His justice is not complete until repayment of damages is awarded in the life of the believer. 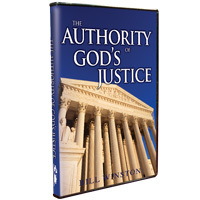 In the first of these single teachings, “The Authority of God’s Justice,” Dr. Winston shares that God is the highest authority in the earth and His statutes and judgments are forever. God is Lawgiver and Judge. “…for God Himself is Judge” (Psalm 50:6). If an injustice has been done to you, take your case to the high court of heaven and let God bring justice and restore to you what was stolen or lost.